Providence, RI (4/22/2012): Jerry Toppazzini, a former American Hockey League player and coach who played more than 700 games in the NHL, died Saturday, April 21, after a brief illness, the Sudbury, Ontario, Star has reported. He was 80 and an active member of the Rhode Island Reds Heritage Society. Toppazzini, a native of Copper Cliff, Ont., scored 20 goals as a rookie with the Hershey Bears in 1951-52 before a lengthy NHL career with Boston, Chicago and Detroit. He later coached the AHL's Springfield Kings from 1972-74. 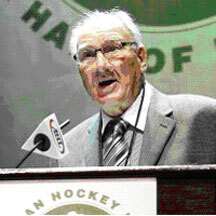 In January, Toppazzini accepted induction into the AHL Hall of Fame on behalf of his late brother Zellio, acclaimed as the Reds’ “Player of the Century,” who passed away in 2001.